Can we always distinguish between a center and a periphery if we talk about a global conflict? Is there a center and a periphery on the surface of a globe? It’s hard to recognize them. And if it's easy, if we can distinguish between a peripheral and a central area on a globe, we should ask why we can do that despite the basic geometrical rules and how these areas are interconnected. Thinking about “globalization” as a recent and primarily economical – only as a consequence cultural – process is maybe a sign of a common narrow-mindedness, especially if we refer to a global event as the WWI was, especially if we refer to a continent as the African one. That’s why we are glad to mention the constitution of a network and the organization of an upcoming conference on Africa and the First World War, promoted by the University of Lisboa and supported by other universities and institutions, that will investigate the topic considering all its historical and cultural aspects. Deadline for submission of proposal is 30th April 2013. Here the CfP. Since the end of the 19th century Africa stood out as an agent in the globalization process; acting both as an element of direct action, particularly through the exploitation of its natural resources in the widest sense possible, but also through the unique features of its political situation as regards international relations. During the “Belle Époque” the network of transactions of goods and people had spread considerably, bringing remote and peripheral places, like the African territories, closer to the centre of the world-economy. In 1914 when the First World War started all major European powers, with the exception of the Habsburg Empire, ruled over territories outside Europe. 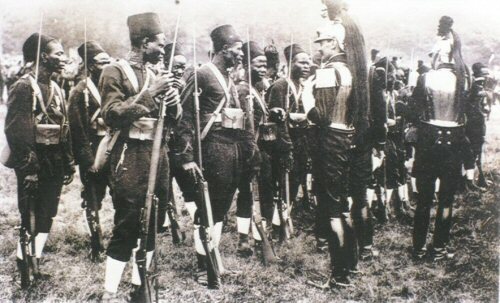 Although most of the clashes have occurred on European soil, the involvement of the African continent played an essential role within the Great War, which was a fundamental expression of the globalization of the conflict: for over four years Africa provided human and material resources on an unprecedented scale to the Western Front. From the “black continent” standpoint, it is worth to note, how the First World War contrasted in terms of objectives, impact, scale and duration with the many conflicts that erupted throughout the nineteenth century, conducted mainly against native populations, and motivated by local and limited objectives. The first World War represented a defining moment, introducing a profound break in the course of European and global contemporary history, whose rupturing and long-lasting effects significantly involved, marked and influenced the population and the history of all European empires in Africa. Yet, this particular front continues to be one of the less studied aspects of the Great War. · war and peace in Africa. The selection of proposals will be guided by the purpose of ensuring maximum quality and diversity of topics.